By the time you read this, my 2nd anniversary of moving to New York City will have passed. Like most weeks, it was rather uneventful and busy with work. Though tired as usual, I couldnt help contemplating where my life is heading. After two years of working and living in this fast-paced city, Im surprised to find that Im still a little uncertain about it. Moving here was propelled by a great career opportunity that I couldnt turn down, but my honeymoon period with New York had ended a couple years earlier, during previous internships Id done here. As I settled into my fourth-floor studio apartment, I no longer felt the excitement and wonder of so many students and young professionals around the world who dream of living here. Instead, I found myself battling expenses, egos, and a dwindling sense of passion. All of that stopped when I moved here. But its not entirely the citys fault. Theres plenty to do, and a raw energy that radiates through New Yorks 8 million residents. Even strangers and visitors remark upon this aura, this vitality that cannot be captured. But it belongs to the city, not to me. Ive tried to borrow that energy by tapping into the veins of New York. Walking the grid of streets, I continuously explore and find things to appreciate. I love running my hands through the grassy plants along the Highline, an urban park converted from the old railroad track. I love the tiny, foreigner-filled restaurant in Nolita that exudes coolness but pretends its not that hip. I love the farmers markets, flea markets, street markets, any market. Most importantly, I love the sassy 13-year-old girl I mentor, and the good friends I have made here. Yet even with all the positives, most said they did not expect to stay here long-term, echoing my own mixed feelings. New York has never been shy about its complexity and allure, but I never realized how tough it would be to live in that, day in and day out. Im here now, but who knows where Ill end up. Thats the excitement of life. Thats something New York City has taught me to embrace. 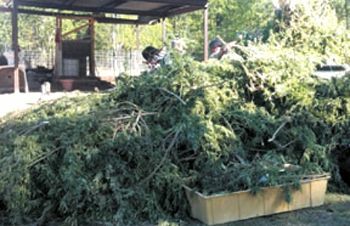 A major marijuana-growing site was discovered near County Road 2050 in Liberty County, and authorities have been busy removing what they describe as millions of dollars worth of the illegal drug. The site was originally located Oct. 18, when deputies from the Liberty County Sheriffs Office Crime Suppression Unit arrived on the scene along with federal agents. Reports from the LCSO indicate this is the largest growing and cultivating operation ever seized in Liberty County History. Sgt. Alexander of the LCSO said in reports that the street value of the found marijuana could be more than $4 million, and that at least 6,000 plants had been found on the scene. The site was very sophisticated, and included an irrigation system, artificial lighting, and exhaust and air conditioning systems. Also found at the site were bunks for sleeping, guard posts, a kitchen and a gymnasium, authorities said. Law enforcement personnel discovered multiple firearms and defensive measures put in place to protect the operation, as well as numerous animals and livestock, which the Houston SPCA volunteered to help with. Though there is evidence that points to connection with a drug cartel, little information has been released as to who might be behind the growing operation. One arrest has been made on the scene; Logan Williamson was taken into custody on Oct. 23 by LCSO deputies for being in possession of drug paraphernalia. CROSBY  The Crosby-Huffman Chamber of Commerce is on the march, beginning processes of purchase of a new office building, quadrupaling monthly membership increases, launching new community clean-up and spirit committees and held elections last Thursday for board members. Newly elected are Judy Sirocka of Crosby Office Supplies and Bob Ward of Bobs Computers. Chosen for a vacated post is Terri Aubain of Alliance Properties actually #8 in votes but Dan Meaux #7 decided that the post requires lots of business time when he needs it to operate a restaurant. Re-elected are Venita Smith of KMCO, Kim Harris of United Community Resouce Credit Union, Velma Ellison of Alliance Properties and the Rev. Dr. Larry Koslovsky of Crosby Brethren Church. The Board officially announced their decision to purchase 5312 First Street at the Oct. 20 luncheon inside the American Legion David H. McNerney Post 658 dining hall. The staff of President Glenda Logsdon and Dayna Rankin are cooperating to increase the membership to about 19-20 new members each month against about 3 per month previously. Meanwhile new office equipment and technical capabilities have been added by the board to facilitate the growth. The rapid decision to act on the availability of the property was played out in a series of specially called board meetings with more to come to decide on furnishings and future needs. New committees have been formed and are generally guided by Danya Rankin as Glenda Logsdon not only acts as representative to prospective members but also addresses community needs. A new Pride and Spirit Committee has been lauched for a cleaner view and youth aware community. On my most recent trip home to Houston, my parents and I went to Clear Lake for an evening sail on our boat. The weather was good, the waters calm. After a busy day, we were looking forward to the relaxing rhythm of the waves and the fresh, salty air. Unfortunately, when we got to the marina, we found several inches of water inside the cabin. Somehow our sailboat had partially flooded! So instead of a leisurely night enjoying the surf and the breeze, we spent two hours with a plastic bucket and a leaky pump, bailing out the stale and murky water. By the time we finished, we had mosquito bites on our ankles, our clothes were spattered with dirt, and our skin was covered in a fine layer of seawater and sweat. Anyone in their right mind would have been miserable. And yet, my parents and I smiled and joked as we headed to the bathrooms to clean up. Upon reflection, I realized that in a weird way, I actually enjoyed that night of gross, sweaty work. Because my parents and I were spending time together. Because I was helpful to them. As an only child, Ive always had a close relationship with my parents. But now that I live so far away, I see just how much we did as a family, and how hard it is to do that kind of stuff now. Thanks to technology, my parents are never more than a phone call or an email away, but its not the same as hopping in the car for ice cream at Dairy Queen, or going to see a movie on a whim, or just hanging out at home with the TV on, all of us sitting in our reserved seats on the couch. Things that I used to take for granted. Things that arent so easy anymore. Whenever I visit home, my mom asks if I want to do anything, and my dad asks if I want to go anywhere. Favorite restaurants, new museum exhibits, the beach at Galveston, even Austin or San Antonio. I know they just want me to have fun, but I always tell them not to go to any trouble. They cant understand why. That night, after our decidedly not-relaxing evening on the boat, we put our swimsuits on, rinsed off, and then hopped into the community pool at the marina. Beneath a dark sky filled with stars, we floated on our backs and kicked our legs. We sat on the deck chairs and ate cherries. We talked and laughed and talked some more. I guess thats the real reason that night didnt feel miserable to me. Thats why we dont need to go anywhere or do anything special. Because were together, spending time as a family again. And thats enough. 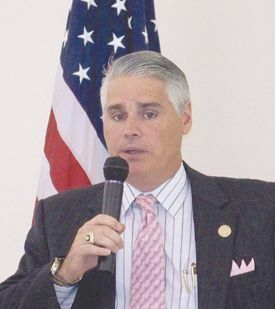 HIGHLANDS State Representative Dan Huberty paid a visit to a district that he will probably not represent after the courts certify the redistricting lines. Huberty said he expected that decision in November, but was glad to visit with the Highlands-Lynchburg Chamber in the meantime. His talk at the regular luncheon meeting of the Chamber was about the bills that passed or did not, in the 82nd Legislature that finished in April. Huberty was a freshman legislator, representing District 127, everywhere from his home in Kingwood to Highlands. Because he had served on the school board in the Humble ISD, he was appointed to two committees: Public Education, and State Affairs. He said that he was comfortable and knowledgeable in both areas, and thought these were good appointments. The legislature originally considered over 6000 bills, and finally passed 1387, but it spent much of its time working to balance the budget and avoid a shortfall in the two-year budget. Originally the shortfall seemed to be about $27 billion bienally, but after cost reductions and the comptroller certifying additional revenue, the shortfall came down to $4 billion. The total budget for two years ended up at $172 billion. Some costs were met by tapping in to the Economic Stabilization Fund, or so-called rainy day fund. This was originally $9 billion, but only $5 billion now remains for future emergency needs. — HB250, permitting the continued manufacture and sale of conventional light bulbs inside the state of Texas, in spite of a federal regulation that will outlaw them nationally in a few years. Its happened again! 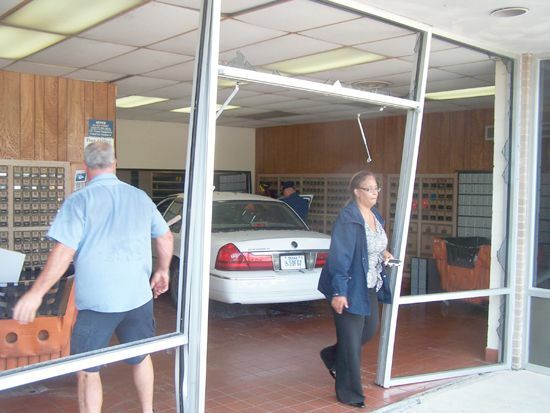 A Post Office Patron, Ms. Joe Lowrance, lost control of her car and drove into the lobby of the Highlands Post Office, severely damaging the front windows, doors and many of the post office boxes inside. The accident happened last Friday, October 7th at about 3:20 p.m. according to Highlands Post Master Anita Skillern, seen above surveying the damage. This is the third time in recent memory that an accident of this type has happened. Skillern said she expects the Postal Service to install guard posts in the future. Injured in the accident was Ms. Pauline Cutbirth, a patron who was standing in the lobby, when the out of control Mercury sedan hit her. It was reported that she suffered a broken ankle and numerous contusions. Highlands VFD transported Ms. Cutbirth to the hospital, where she was treated and released. Also in the car was a passenger, Ms. Sandra Wallingford, who reportedly was not injured. The Post Office is open for business, but plywood has temporarily replaced much of the glass. CROSBY  A local tradition will take place this weekend, as the Crosby Zydeco Festival returns to the Crosby Fairgrounds this weekend, Oct. 14-16. The celebration is fitting for the Crosby area, Barrett said. Crosby is like a town in Louisiana. Zydeco is indigenous to the area, and people all over the world know about the influence this place has had on zydeco, Barrett said. Barrett said that a pink balloon release will take place Sunday as part of that celebration. Over the course of a lifetime, one out of every eight women will be diagnosed with breast cancer, said Tania Cruz, public relations and events manager for the Susan G. Komen Houston chapter. The Houston Affiliate of Susan G. Komen for the Cure works hard to save lives and end breast cancer forever through its programs and funding in Southeast Texas. The weekend fun will kick off with a gumbo cook-off Friday night. At 10 p.m. that night a dance featuring Lil Pookie Zydeco playing a stand. Saturday brings a number of music artists and groups, including Lil Nate and the Zydeco Big Timers, Step Rideau and the Zydeco Outlaws, and Leon Chavis and the Zydeco Flames. The trail ride will also start at 11 a.m. that day. Sunday will feature a Party on the Green, featuring singer Cupid. Barrett will present a donation check to the Komen Foundation during the event, according to a press release. 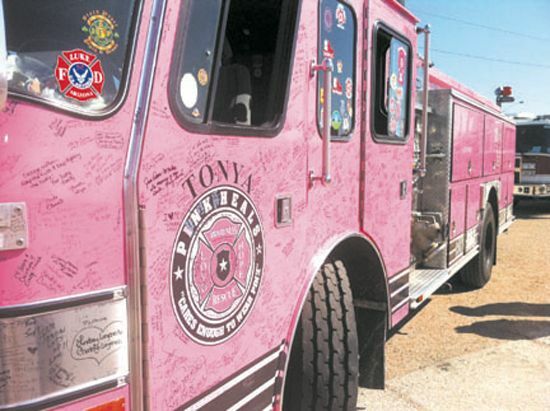 I am encouraged to do more for breast cancer awareness now and in the future because the Crosby Zydeco Festival is going to change lives, educate people and raise awareness for the cure, Barrett said. Tickets to the event are $15 per person, but a weekend pass can be had for $30. This grant admission to all events over the weekend, including the trail ride. Tickets can be purchased at www.solomusicfest.com, and more information on the event is available by calling 281-860-7656. As the tradition of the Highlands Jamboree continues into its 55th year, the community support and participation just seems to grow. This year, with the weather just outstanding, more people turned out for the various events than in many recent years. The 5K Fun Run/Walk, sponsored by Habitat for Humanity, started at the Highlands Community Center on Saturday, shortly after the 7:00 a.m. sign-in. Winners will be announced in next weeks paper. The parade was longer, noisier, and crazier than usual, as the them was Highlands… A Hidden Treasure and most floats and participants came dressed in Pirate Garb! 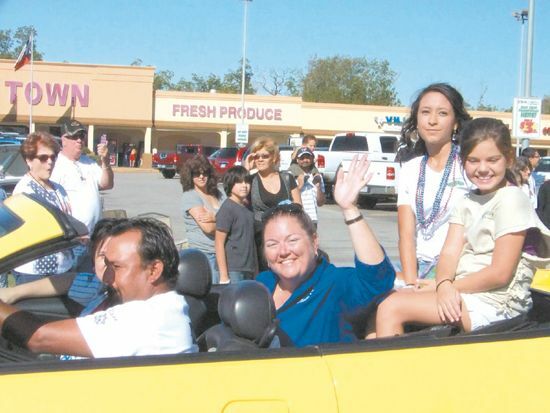 Judges for the best floats were Brook Terrell, Ramona Villarreal, and Chelsea Read. Best of Show Float was by ZXP Tech. See box on page 2 for more results of the judging. Then the action moved to the Highlands Elementary School, where the multi-purpose room was packed with parents and friends for the Childrens Pageant, silent auction and other awards. Please see photos and winners in this issue. The crafts and organization booths in the gymnasium were busy, with more groups represented than ever before. A new event this year was a booth selling Homecoming Dance Tickets. A long line formed, and news came that the event was sold out before the day was over. The Hidden Treasure also included lots of food, as the Boy Scouts had their BBQ tent, and ice cream and other vendors helped everyone fill up and enjoy themselves. Best of Show, #2 Carl Green with his 56 Purple Chevrolet. Festivities continued into the afternoon, and as the Jamboree ended about 3 p.m., it seemed that most people were not ready to go. 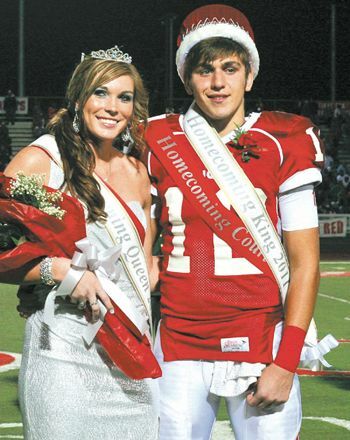 But as an alternate, they could travel to the Highlands Junior School, where the Junior Miss Highlands Pageant took place at 2 p.m., with 10 contestants, and at 7 p.m. when 11 local girls competed for the coveted title of 2011 Miss Highlands. See elsewhere in this issue for the results of the Pageant contest. Proceeds from the Jamboree go to support the Chamber and its activities. Official sponsors this year were Woodforest National Bank, Portraits of Texas, ZXP Technologies, San Jacinto Methodist Hospital, Constable Ken Jones, Kostka Auto Repair, United Community Credit Union, MegaSand Enterprises, Amegy Bank, Rainbow Jewelry & Loan, BJ Portascan, Timesaver, Community Resource Credit Union, and Star-Courier. A replacement has been named for Precinct 4 Comissioner Jerry Eversole, who gave up his office in the wake of legal turmoil a few weeks ago. 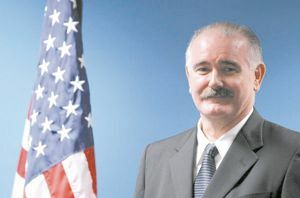 Harris County Judge Ed Emmett has given the post to R. Cactus Jack Cagle, a civil court judge for more than a decade. Eversole has been in and out of the courtroom for several years, embroiled in charges of official corruption and bribery stemming from his business partnership with county contractor Michael Surface. After more than two decades in office, Eversole stepped down and pled guilty to one count of lying to federal investigators at the end of September. Cagle, a graduate of Rice University, was sworn in during the Oct. 4 meeting of the commissioners court in Houston. Cagle has sat on the bench of Harris County Court-at-Law No. 1 since being elected in 2000. He has earned some of the highest ratings from the Houston Bar Association and has garnered several awards from local groups during his tenure on the bench. During this process, my goal was to find someone who could best serve the constituents of Precinct 4, Emmett said in a press release. I met with and spoke with dozens of folks in the community about the Precinct 4 commissioners position in recent weeks. Jack quickly emerged as the top candidate because of his mature judgment, keen intellect, unquestioned integrity and his many years of work in the community. Approximately 70 people had their names in the running, but Emmett said in a press conference that he had considered around a dozen of those names for personal interviews. Cagle impressed Emmett with his professional demeanor, and he considers Cagle to be a good candidate for election in 2012, Emmett said during that conference. Cagle joins Emmett and commissioners El Franco Lee of Precinct 1, Jack Morman of Precinct 2 and Steve Radack of Precinct 3.